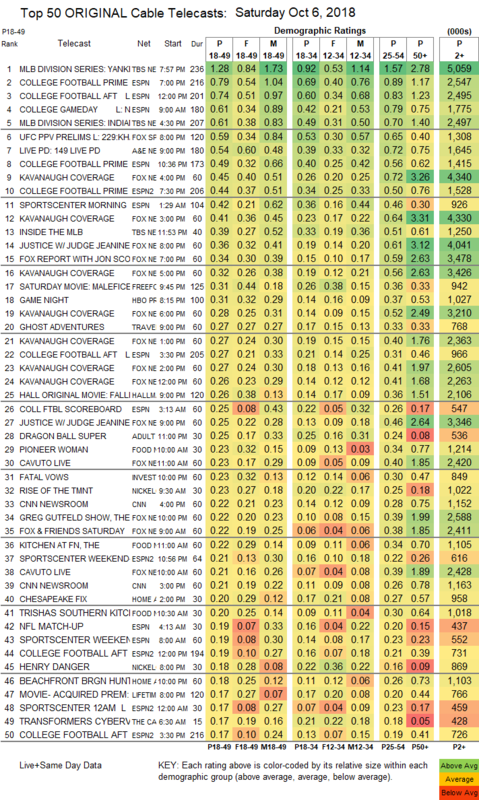 NETWORK FINALS: ABC’s COLLEGE FOOTBALL game adjusted up by 0.1. In addition, DATELINE lost 0.1 in final numbers. CABLE HIGHLIGHTS: Sports reigned on Saturday cable. TBS’s MLB PLAYOFFS games were at 1.28/0.61, and the day’s slate of COLLEGE FOOTBALL games was led by ESPN’s primetime game at 0.79. In addition, Fox Sports 1’s UFC telecast was at 0.59. 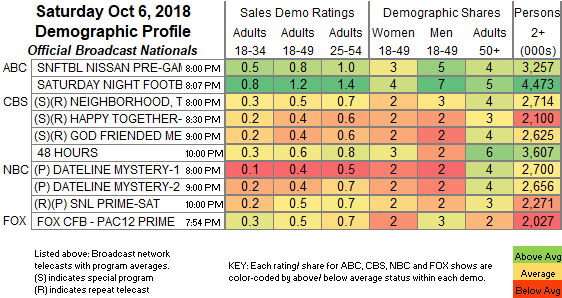 The highest-rated non-sports show was A&E’s LIVE PD, down 0.07 to 0.54. Fox News continued to reap the benefits of its Bret Kavanaugh coverage, topped by the 4PM hour at 0.45. Travel Channel’s GHOST ADVENTURES rose 0.09 to 0.27. Hallmark’s movie FALLING FOR YOU was at 0.26. Adult Swim’s line-up performed as follows: DRAGON BALL at 0.25 and 0.17/536K compared to last week’s 0.30 and 0.21/622K, MY HERO ACADEMIA down 0.07 to 0.14/415K, NARUTO down 0.07 to 0.15/364K, BORUTO down 0.06 to 0.17, FLCL down 0.02 to 0.15, ATTACK ON TITAN down 0.02 to 0.16, JOJO’S BIZARRE ADVENTURES down 0.04 to 0.13, BLACK CLOVER down 0.04 to 0.14/300K, HUNTER X HUNTER down 0.03 to 0.14/263K, ONE PUNCH MAN down 0.02 to 0.14/269K, LUPIN THE 3RD down 0.01 to 0.12/229K, COWBOY BEBOP down 0.01 to 0.12/223K, and SAMURAI JACK steady at 0.13/231K. On Food Network, PIONEER WOMAN climbed 0.07 to 0.23, KITCHEN AT FN rose 0.05 to 0.22, and TRISHA’S SOUTHERN KITCHEN was up 0.05 to 0.20. ID’s FATAL VOWS edged up 0.02 to 0.23. On OWN, IYANLA, FIX MY LIFE fell 0.06 to 0.14, and BLACK LOVE was at 0.10. HBO’s FLIGHT OF THE CONCHORDS special was at 0.10.